DigitLab is a leading digital marketing agency in South Africa, which combines digital innovation, technology, content and strategy to help build brands in a digital world. 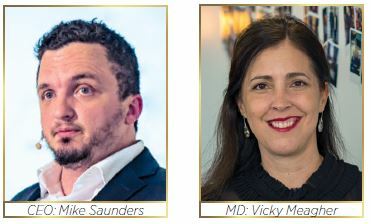 Led by founder and CEO, Mike Saunders and Vicky Meagher, managing director, DigitLab has grown from strength to strength over the last few years. Established in 2011, DigitLab has worked with more than 30 local and international brands and businesses, helping them win the hearts and minds of their consumers through captivating digital experiences. DigitLab's Johannesburg office was opened in 2018 to help the digital marketing agency better service their Johannesburg clients. The head office is based in Hillcrest, KwaZulu-Natal. As a business, DigitLab is a collaborative agency that works hand-in-hand with its clients to create successful digital marketing campaigns and content. Sticking to its narrative of 'helping people win', DigitLab's diverse team of creatives, designers, developers, programmers, strategists, technologists, and writers all work together to craft and create beautiful digital experiences for their clients. "Nobody counts the number of ads you run; they just remember the impression you make." As the world and businesses evolve, consumers are more discerning - brands must inspire loyalty to succeed in the modern marketplace. At DigitLab, we work with brands to create captivating digital experiences that help brands to win the hearts and minds of their consumers. As an agency, DigitLab works closely with brands to develop actionable brand strategies, carry out competitive market analysis, leverage digital platforms and use transformational thinking to differentiate and transform brands and businesses. With a digital-first mindset, DigitLab uses the power of social media to create powerful campaigns that are tailored to each of our clients. While strategic and unique content paired with a team of dedicated community management ensures our client's online customer service and community engagement are being looked after. DigitLab's dedicated search engine optimisation (SEO) team puts strategy into play and uses technical optimisation, auditing, content marketing and outreach to make our client's brands discoverable. Using expert techniques to make brands and businesses visible, DigitLab offers services that include SEO audits and implementation, site optimisation, front-end coding, and strong content marketing strategies. Part of DigitLab's offering includes research to help brands and businesses not only better understand their customers, but also understand their market. These services include online reputation management (ORM), competitor analysis, brand reports and crisis management planning. Reaching the right people at the right time is of utmost importance when it comes to the world of advertising. Through accurate audience targeting on the latforms where your audience interacts most, we can hone in on the people that matter. As a digital media advertising agency, we ensure that your brand's visibility is built through online media, inbound marketing and advertising. As a Digital Agency, DigitLab helps its clients improve their customer experiences by offering app development, web development, ecommerce development, mobile website optimisation and website design. DigitLab also contributes in a number of ways to the local economy. As an employer of over 30 marketing professionals, DigitLab has been integral in developing the digital industry in KwaZulu-Natal through our Digital Swarm events, which aims to accelerate business, digital thinking and promote the development of the digital community in South Africa. The DigitLab Academy, a SETA registered institute, is another way in which we contribute to the growth and development of the digital marketing industry in South Africa and the South African economy. Through the DigitLab Academy, over 150 people a year receive training on a variety of digital skills, including social media masterclasses, SEO, digital brand strategy and influencer marketing workshops. Through internal training and internship programmes, we have also been actively involved in training over 60 staff members in digital marketing and digital business. Many of these staff members have been equipped to start their own businesses in the digital industry, or have continued to work and grow in digital marketing. Our plan is to build an international digital agency with its head office on the shores of KZN. "We are proud of our hometown and hope to add value to its economy and its people." -- Mike Saunders, CEO of DigitLab. Services: Digital Creative and Strategy, Web and App Development, Social Media, Content Creation, Research, SEO and Online Media Placement. To Become a world-renowned digital agency, making a significant contribution in the lives of our clients, our people and our industry. Growth - Expanding our reach and ability to make a significant contribution to our clients, people and industry. Excellence - A call to excellence drives client happiness and success, growth for people and inspiration for the industry. #WorkFamily - Building a team of high performers who help each other win. People are important in any business and at DigitLab we have leant firmly on a culture of Work Family. Making sure that people feel appreciated and valued in the business.